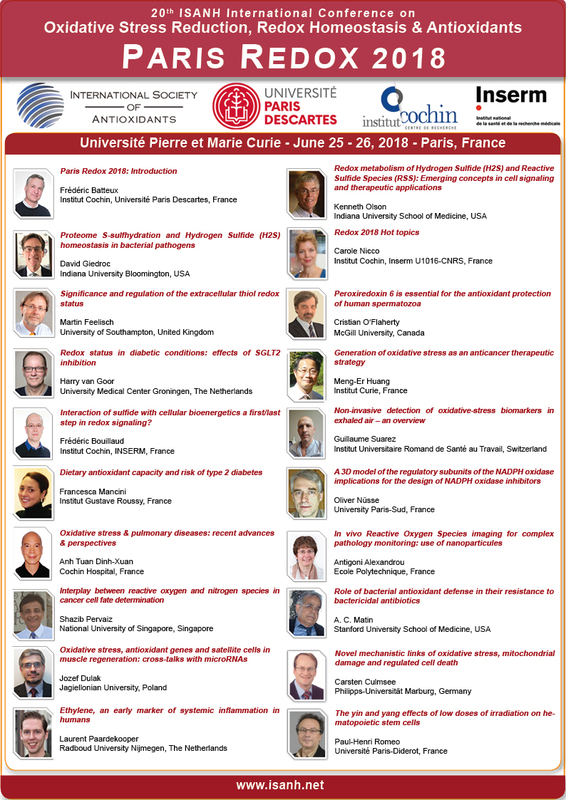 Dr. Laurent Chatre from CNRS, University of Caen-Normandie, France will join us during Paris Redox 2019 to present presentation entitled "Dynamic relationship between the Reactive Species Interactome and bioenergetic metabolism in brain". Summary of talk: Once upon a time… reactive oxygen species (ROS) were thought to be the most deleterious molecules for cells, tissues and organs. Then, thanks to extraordinary efforts from the scientific community, ROS are nowadays also considered as crucial and beneficial messengers. This is true not only for ROS, but also for reactive nitrogen species (RNS) and reactive sulfide species (RSS) that altogether constitute the recently defined reactive species interactome (RSI). I will discuss our opportunity and ongoing works in the laboratory ISTCT/CERVOxy on the dynamic relationship between the RSI, the antioxidant defense and the bioenergetic metabolism in brain tissues and in brain cancer.